Saturday and Sunday, June 1 to 2, 2019, from 10 a.m. to 4 p.m. Doors Open Northumberland allows you to explore the stories behind our community's unique buildings and sites. This free, family-friendly event showcases Northumberland's heritage, architecture and innovation with interactive experiences and tours of over 25 of our most fascinating cultural spaces. Participating venues are located across Northumberland County – from Port Hope to Brighton to Campbellford. With so many amazing places to explore, be prepared to hit the road to experience all of the county's natural charm. Make it a Doors Open daytrip or extend your stay for the weekend to make sure you have time to see it all! Note: Tour buses are advised to contact sites in advance. 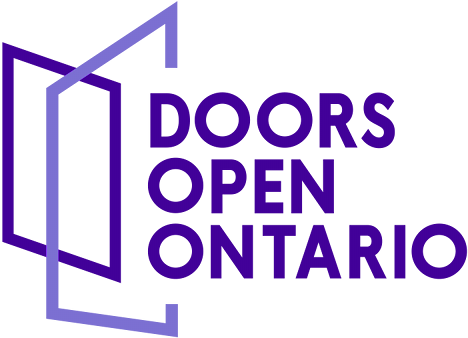 Doors Open provides the perfect opportunity to discover what Northumberland County has to offer! While you're here, enjoy delicious award-winning eateries and accommodations, browse unique shops, or take in our beaches and great outdoor adventures. Doors Open Northumberland County is hosted by a committee of volunteers from all seven municipalities in Northumberland County, with the support of the Northumberland County Archives. For more information, or to sign up as a volunteer, contact us at archives@northumberlandcounty.ca. Eliakim Barnum emigrated from the United States in 1807. He built this house in 1819; generations of the family lived here until 1917. Enjoy a tour of this magnificent home, one of the finest examples of neoclassical architecture in Ontario – faithfully restored by the Ontario Heritage Trust to how it would have been in the 1820-40 period. Constructed for the Township of Seymour, this was the first public building in the area. Over time, it has functioned as a council chamber, courtroom, church, school, jail and more. Since 1988, it has housed the Campbellford-Seymour Heritage Society. Discover local artifacts and explore the newly renovated barn and miniature railroad that recreates the Belleville-Peterborough line from the 1920s. This cannery opened around 1904 close to a new rail line. Operations ceased around 1955; the factory became derelict over the next 60 years. A remarkable renovation has blended the original with the modern to create a showroom for Vincent Sheppard's line of indoor and outdoor furniture. A returning Doors Open favourite, this distinctive building was created by visionary owners. Come and have some fun with the sun at the Dortwood Observatory – where you can enjoy a solar experience and see Earth’s “star” (the sun) in all its glory. There will be several solar-filtered telescopes and binoculars for safe viewing. Astronomy books and videos await in the visitors' centre. Don’t miss the chance to learn with fellow space enthusiasts! The Golden Rail Pub at Branch 133, Legion Village features a historical mural of 59 Cobourg buildings, people, groups and landmarks. During Doors Open, you will have an opportunity to meet the artist, Allan Bender of Blinc Studios, who will be on site to discuss the process and significance of his work. Get a behind-the-scenes look at ongoing restorations at the historical Mill at Piper Creek supported by the community and spearheaded by the Mill at Piper Creek not-for-profit organization. Explore the beautiful interior of this 180-year-old mill and view numerous pieces of original mill equipment. High tea and live music will be offered during Doors Open! Saturday and Sunday: 11 a.m. to 3 p.m. The Port Hope Archives has been operating for 25 years as the repository for archival material and municipal records, including those from the original Town of Port Hope and Hope Township. They have photographs, archival material and some artifacts in the permanent collection. Enjoy a guided tour the stacks and get an inside look at how the archives works. The Roseneath Carousel – built in Abilene, Kansas – has 40 basswood horses and two boats. A 1934 Wurlitzer Military Band Organ Model No. 125 provides the music. The Roseneath Agricultural Society purchased the carousel in 1932 for $675. Between 1986 and 1993, it was restored to its original condition (costing $400,000). Rides on the carousel will be free during Doors Open. 2019 marks the 175th anniversary of St. George's Anglican Church in Grafton. Although the 1844 wooden structure was destroyed by fire in 1908, the current brick church was opened just 10 months later. Designed by Grant Helliwell, the "church with the red roof" features a bell tower with battlements and Gothic-style buttresses and windows. Tour this faithfully restored 1850s Wesleyan Methodist meeting hall. The vernacular, timber-frame building had become derelict until a three-year, privately funded project was initiated in 2008 to restore the building to its original condition. Much of the restoration work could only be achieved by reference to old turn-of-the-century photos.